FL@33's Tomi Vollauschek was commissioned to create a custom letterform 'V' for 26 Creative Characters – an exhibition celebrating the typographical diversity of contemporary graphic design and the 10th anniversary of Utrecht-based design studio Autobahn. 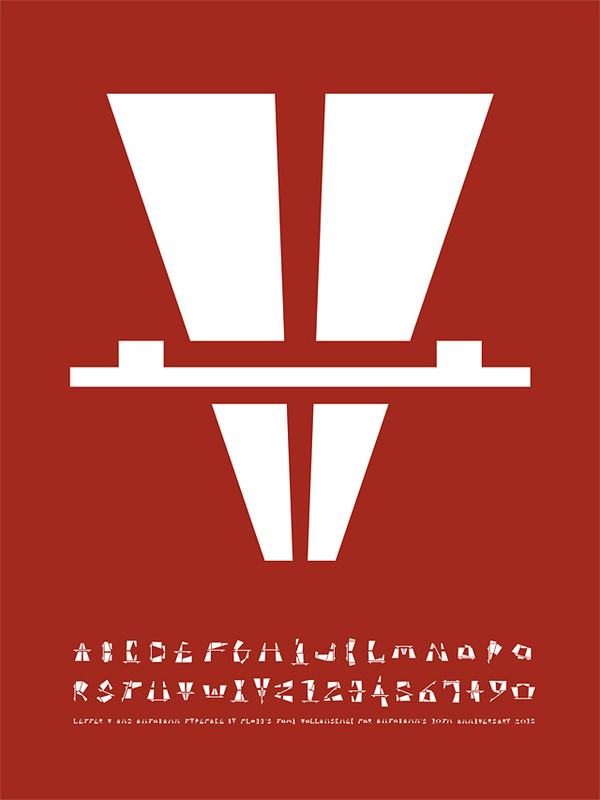 Autobahn's Maarten Dullemeijer and Rob Stolte invited a total of 26 international typographic designers to create a selected letter of the alphabet. The resulting alphabet is displayed during their curated anniversary show 26 Creative Characters. ___ The brief asked to create the chosen letterform and present it as a poster with the dimensions of 30 x 40cm (11.81 x 15.75in), portrait, and in monochrome Bordeaux (Pantone 484C). Invited designers were also encouraged to break any of these rules if needed. 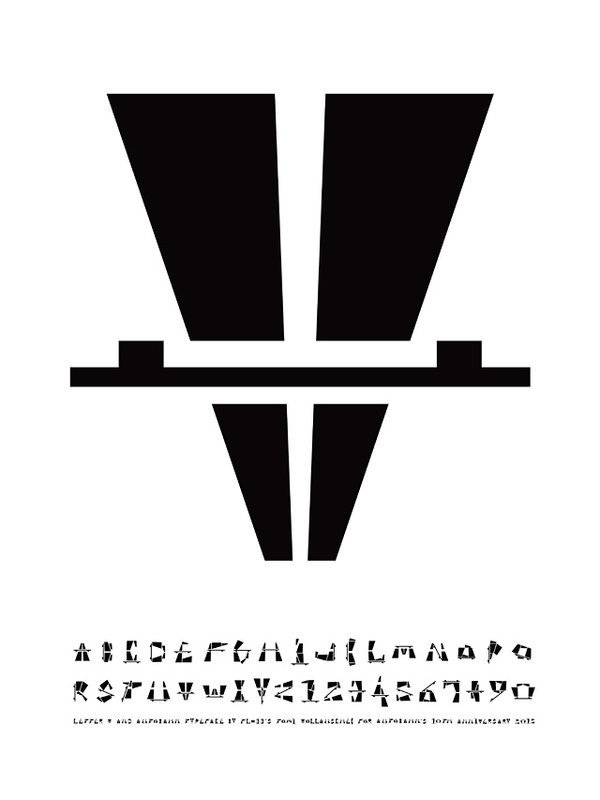 Following numerous experiments going in different directions the temptation to turn the original Autobahn symbol on its head to create a minimal letter V proved too strong for FL@33's Tomi Vollauschek. Concerned this witty design could possibly be considered to be slightly lazy – but also for the sheer fun of it – Tomi created in addition a complete alphabet at this ocassion using only the five elements the Autobahn symbol is made of. ___ Using the original street sign Blue helps to communicate the simplicity of the idea but it also works in Bordeaux.  ___ The descriptive text written on FL@33's poster contribution: Letter V and Autobahn typeface by FL@33's Tomi Vollauschek for Autobahn's 10th anniversary 2015. 26 Creative Characters is a project initiated to celebrate the typographic diversity of todays graphic design. 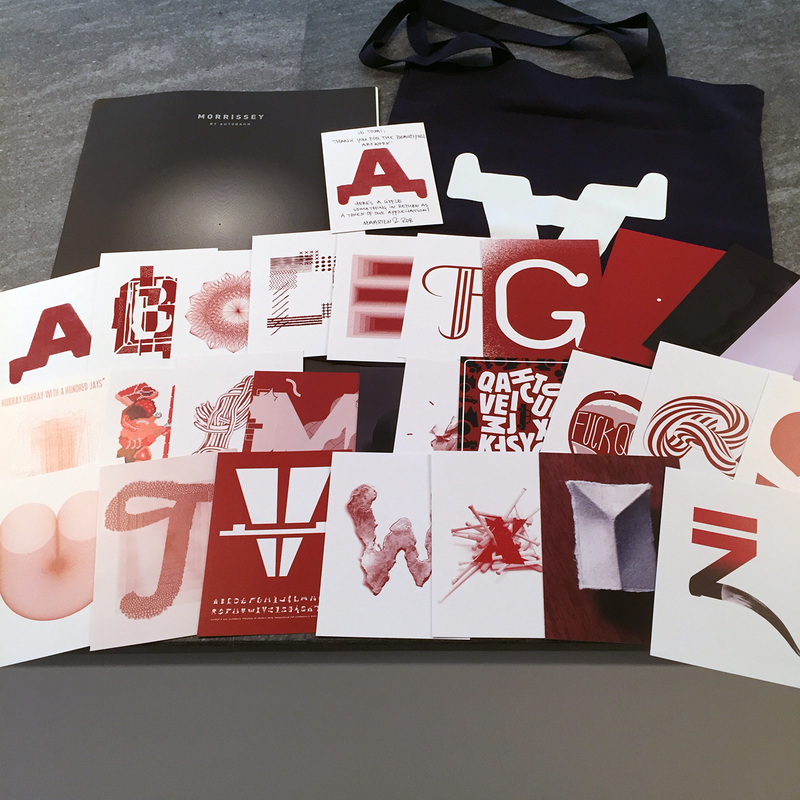 For the occasion of the 10th anniversary of design studio Autobahn, 26 contemporary (typo)graphic designers were invited to each design one letter of the alphabet. The result is a unique mix of styles, materials and ideas: from hand crafted letters with needle and thread by Evelin Kasikov, or the collection of baseball bats by Joachim Baan to the mesmerizing patterns of Hansje van Halem and vector skills of Alex Trochut. 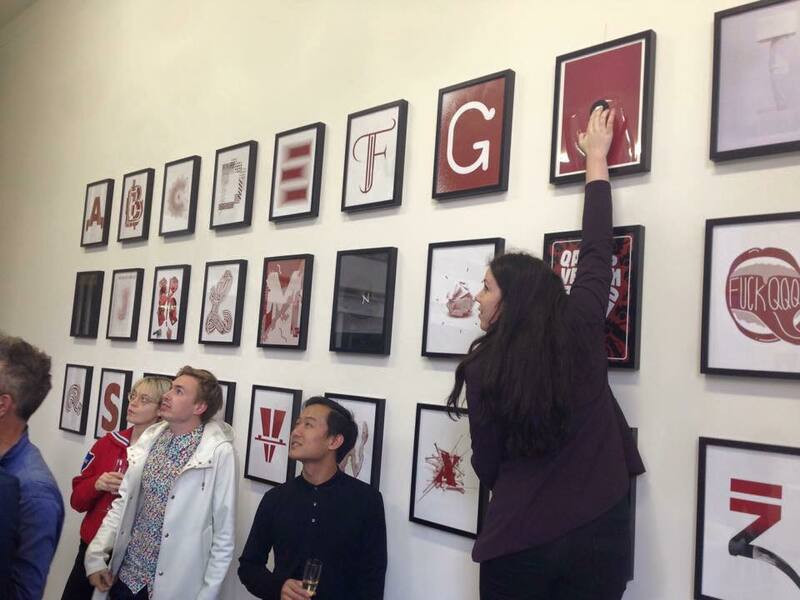 The letters are presented in print, combined with several original artworks on display. Also some objects will be for sale. Autobahn Gallery is the new gallery space of design studio Autobahn. The gallery is open by appointment only. The exhibition runs from Friday 30th October until the private view on Friday 18th December. Please follow Autobahn on facebook.com/autobahngallery for more information, photographs and other projects. The photo showing the wall of 26 Creative Characters was taken on October 29th, 2015, during the private view and is shown here with kind permission by design studio Autobahn. Below: one of our snapshots of a postcard set featuring all 26 custom letterforms. November 11th, 2015 — FL@33's letterform V and Autobahn typeface contribution to 26 Creative Characters exhibition featured in IdN's Pick of the Month section.